A bulging disc is usually diagnosed through a scan such as an MRI from your doctor or physiotherapist. Bulging discs are very common and you can usually get back to normal day-to-day within just a few weeks. Bulging discs can occur from many different incidents such as an awkward movement, lifting heavy things incorrectly, or a car accident. Bulging discs can cause pain in your back and can sometimes give you referred pain down your arm or leg – such as sciatica. Don’t worry, when it comes to bulging discs, there are multiple treatments dependant on the extent of your condition. Bulging discs can be treated by physiotherapy through a few different techniques. In your first appointment, your physiotherapist will assess your body, your movement and your pain. Information and education to understand your bulging disc through scans/x-rays (if you have one). A gentle massage or manipulation to relax the muscles in your back. You’ll go home with a set of exercises to practice at home to help relax your back muscles and start to strengthen your core to help support your back. What does a bulging disc technically mean? In between each vertebrae of your spine is a squishy disc that helps your back move around easily. Through accident or damage, a disc can bulge and poke out of it’s home and press on surrounding nerves or muscles. When the disc bulges like this it can cause pain and discomfort. I have a slipped disc, herniated disc or ruptured disc. These issues basically describe different severities of a bulging disc. Your disc has not ‘slipped out’ of your spine, this is just an expression. How can physiotherapy help my bulging disc? Bulging discs is one of the most common types of pain or injury we deal with at our physiotherapy practice. Our physiotherapists are highly skilled in treating and managing back pain. If you would like some more information or would like to book an appointment, make an appointment using the button below. Physiotherapy treatment for bulging discs, slipped discs, ruptured discs and herniated discs is focused on providing symptomatic relief, restoring pain-free movement and learning about the optimal spinal and pelvic positioning that reduces the compression placed onto the disc. Once the disc has healed, and your symptoms have reduced, it is important to continue your rehabilitation program to ensure the risk of re-injury is minimized. Ongoing rehabilitation should be focused on addressing the underlying cause of the initial disc injury. The intervertebral discs are located between the vertebrae (bones) of the spinal column. These discs are composed of multiple rings of fibrous tissue that enclose a jelly-like centre, and function primarily in shock and load absorption. 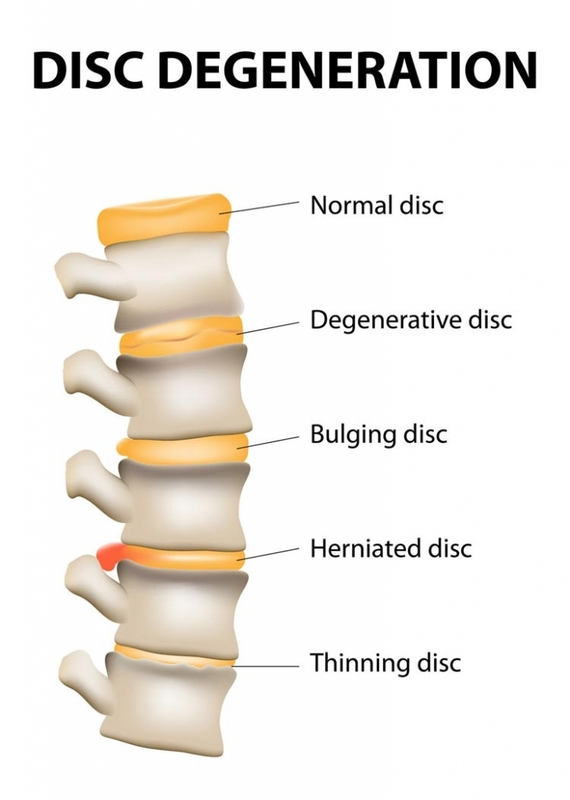 The discs located at the bottom of the spine absorb the majority of the trunk weight, thereby predisposing them to injury and developing into a disc injury such as bulging disc, herniated disc, ruptured disc and slipped disc. Injury to the fibrous rings can occur throughout either the outer, middle or inner layers. When a complete tear occurs in the disc wall, the fluid contained within the centre has the potential to leak through the tear and irritate the nearby nerves. The intervertebral discs are often aggravated due to an increase in mechanical load, with this load changing according to the position of the spine and pelvis. Bending forward and prolonged sitting typically aggravates the pain and nerve irritation associated with injury to the disc. During an acute flare-up, it is recommended to take appropriate medication to allow the pain to settle (e.g. analgesics/paracetamol), to reduce inflammation (e.g. anti-inflammatories/ibuprofen) and reduce muscle spasm (e.g. muscle relaxant). For severe cases of nerve irritation, there are new medications to reduce the sensitivity of the nervous system. Medications should be discussed with your family doctor prior to commencement.